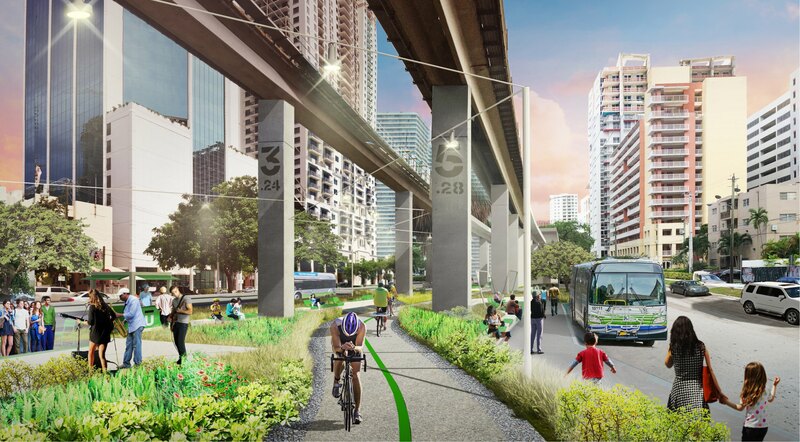 The Underline will transform the land below Miami's Metrorail into a 10-mile linear park, urban trail and living art destination. 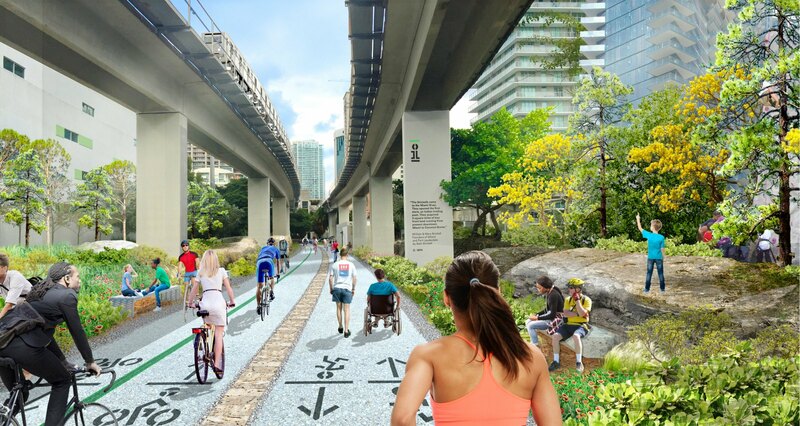 We are transforming the underutilized land below Miami’s MetroRail, from the Miami River to Dadeland South Station, into a 10-mile linear park, world-class urban trail and living art destination. The Underline will connect communities, improve pedestrian and bicyclist safety, create over 120 acres of open space with restored natural habitats, encourage a healthy lifestyle, provide an easily accessible place to exercise, create a mobility corridor that integrates transit, car, biking and walking, provide a 10-mile canvas for artistic expression, attract development along US1, and generate significant economic impact. 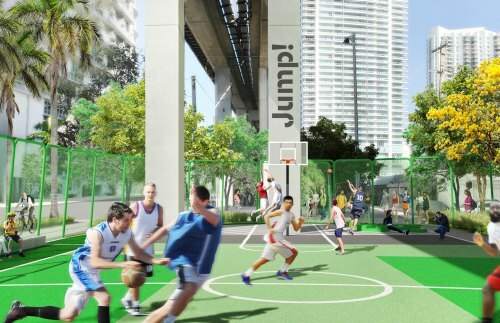 The Underline’s Brickell Backyard will open June 2020 and will be maintained, managed and programmed by The Underline Conservancy funded with the support of people like you, companies and foundations. Construction Phases: There will be 6 construction sections along the 1/2 mile span. Section 1 Miami River to SW 7th St; Section 2 SW 7th to 8th St; Section 3 SW 8th to 10th St; Section 4 SW 10th to SW 11th St; Section 5 SW 11th to SW 13th St; Section 6 road resurfacing and new signalization at SW 7th, 8th and 13th streets. Sections will be sequentially fenced from Section 1 to 5. Once an area is fenced, the fencing will remain in place until construction completion. Join now to be a Friend of The Underline to get updates on events and other important news. 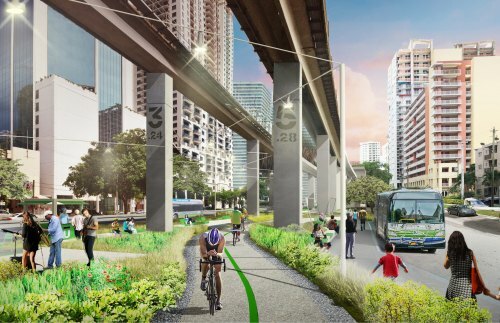 Friends of The Underline is a 501(c)3 nonprofit organization transforming the underutilized land below Miami’s Metrorail into a 10-mile neighborhood park, multi-modal, world-class, urban trail and canvas for artistic expression to create a safer, healthier, more connected, mobile and engaged community. The Underline will be open to all and serve all with amenities and art that will connect people to place and each other. Where did the idea of The Underline come from? Friends of The Underline founder, Meg Daly, broke both of her arms in 2013. Since she could not drive and had to go to physical therapy, she took Metrorail near her home and walked underneath the train tracks to her destination. Even in July, she did not feel hot in the shade of the tracks. She also noticed how wide the corridor is and that she was the only person using it. Meg realized that the land could be utilized as a linear park and urban trail. Who is the professional masterplan design team and how were they selected? Through a competitive process, James Corner Field Operations (JFCO) was selected from a field of 19 applicants to be the masterplan design. This team created a masterplan framework and detail for two demonstration projects. The companies working in collaboration with JFCO include Fairchild Tropical Botanic Garden, Kimley-Horn, HR&A Advisors, HLB Lighting and Pentagram. Who is making The Underline happen? Friends of The Underline are transforming the land below Metrorail from the Miami River to Dadeland South. The Friends group is working with Miami-Dade County Department of Transportation & Public Works to raise county, state, federal and municipal grants. The management, maintenance and programming of The Underline will be run by a 501C3 represented by the County, FDOT, FTA (Federal Transit Authority), Friends of The Underline and three municipalities. Why is The Underline only being built to the south? The area underneath the Metrorail from the Miami River to Dadeland South (the footprint for The Underline) is owned by Miami-Dade County. Once over the river, the area under Metrorail is much more complicated due to land ownership, right of ways, etc. We are mapping how to get over the river, and connect north, west and east access points once The Underline is built. Why is The Underline being built in phases and not all at once? The Underline is being built in phases based on funding and to have the least amount of impact to users of the existing path. What is the total budget for The Underline's design and construction? $80 million for the two trails, lighting, seating, native landscaping and other amenities. $20 million for intersections improvements (over 30 intersections). $20 million for destination parks. Some of the funders include Miami-Dade County, the State of Florida, FDOT and the cities of Miami, Coral Gables, and South Miami and the John S. and James L. Knight Foundation, the Miami Foundation, the Health Foundation of South Florida and Mitchell Wolfson Foundation. For a better breakdown of funding by phase, please refer to our Progress page. Additional funding will derive from public and private sources. Do you disclose Friends of The Underline financial activities? Yes, Friends of The Underline is a 501C3 non-profit organization and our most recent financials can be found on Guidestar. Where will my donations go? Your donations will be used to help support the mission of Friends of The Underline. We are a 501C3 non-profit organization and your donations are tax-deductible. We really appreciate your support! Donating to The Underline is simple. You can donate online or send a check made out to Friends of The Underline and mailed to Friends of The Underline, 1172 South Dixie Highway, #559, Coral Gables, FL 33146. Every tax-deductible dollar you donate will support our mission and will contribute to a safer and more beautiful Miami. If you have questions, please contact Amy Rosenberg at 305-610-8091 or amy.rosenberg@theunderline.org. How do I honor or memorialize my loved ones by naming something for them in the park? Construction for Brickell Backyard (Phase 1, Miami River to SW 13th St.) had a groundbreaking ceremony on November 1, 2018. Phase 2 (SW 13th St. to SW 19th St.) is projected to begin design Spring 2019. To stay up to date with construction progress, please refer to our Progress page. What is the MPath? Will The Underline and MPath be closed until the entire project is built? 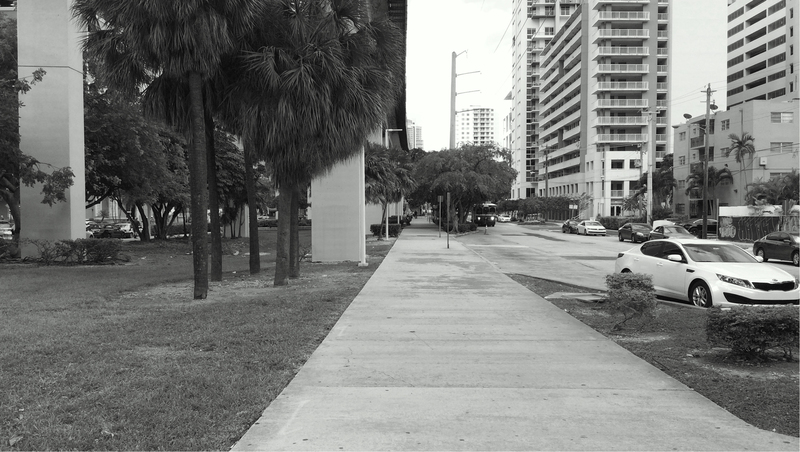 The MPath is an existing asphalt path below Metrorail. During construction, the MPath will be accessible but some detours might occur. The Underline will be open as each phase is completed. How long will it take to finish The Underline? Each phase? Projects with similar vision and scope have taken a decade to complete. We project each phase taking a year to a year-and-a-half to complete. You can help us build it in less time by supporting the initiative and donating to the cause. What are you doing about safety for bicyclists and pedestrians? User safety is one of our biggest concerns. 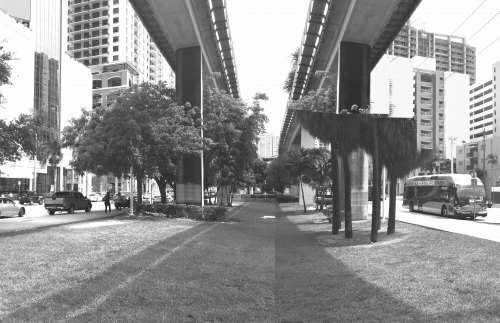 Currently the MPath, the bike path underneath the Metrorail, has limited lighting or amenities, and needs wider and safer crosswalks. All of these, and other safety issues, are being addressed. What does security look like on the future Underline? The Underline will include ample lighting, patrolling security, and CC cameras along the trail. How will The Underline be maintained? Management, maintenance and programming will be done by a public 501C3 called The Underline Management Organization. What types of programming and amenities will be available once The Underline is built? Along the estimated 120 acres, the linear park and urban trail will feature amenities including butterfly gardens, dog parks, exercise equipment, basketball court, mini-soccer pitch, sound stages and monumental art. To serve users of all ages, The Underline will feature numerous health and wellness, meditation, cultural, educational and environmental programming. Plans are in the works to include WiFi along The Underline. Bathrooms are not in the design scheme of the masterplan. The Underline is adjacent to many commercial establishments that provide easily accessible public bathrooms and are available inside Metrorail stations for riders. I have an idea for The Underline. How do I send it to you? One of our top priorities is getting the community involved! 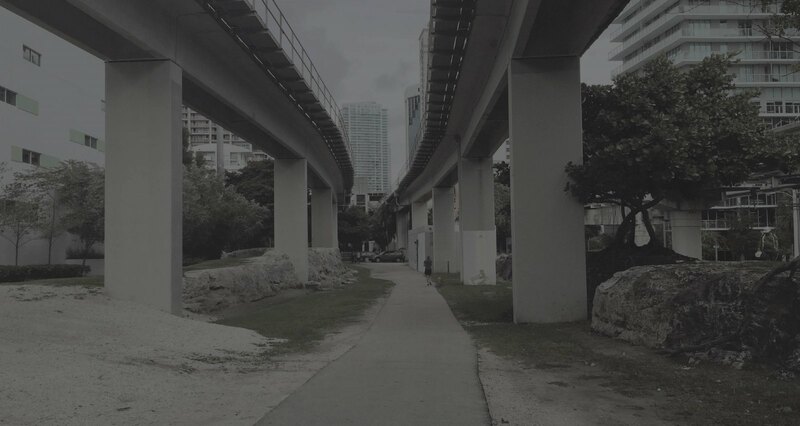 Please email us at info@theunderline.org with your design comments or post on our social platforms Facebook, Instagram or Twitter @theunderlinemia. Copyright © 2019 The Underline.